Hello everyone -thanks for stopping by today! So, how many of you have a Daddy or a hubby who can fix "all things" with either WD-40 and/or Duct Tape? Let me tell you, those were 2 things my Daddy was never without -especially the Duct Tape! We used to give him such grief over the fact that he thought anything could be fixed with a roll of Duct Tape. Today happens to mark the 6 year anniversary of my sweet Daddy's passing and I wish with all my heart that he were still with us so that I could give him this card. He had the best sense of humor and I know he would get such a kick out of this card! I can just see that goofy little grin of his and imagine that wonderful laugh of his! * The WD-40 can is actually an SVG file of a hairspray can that I re-vamped. 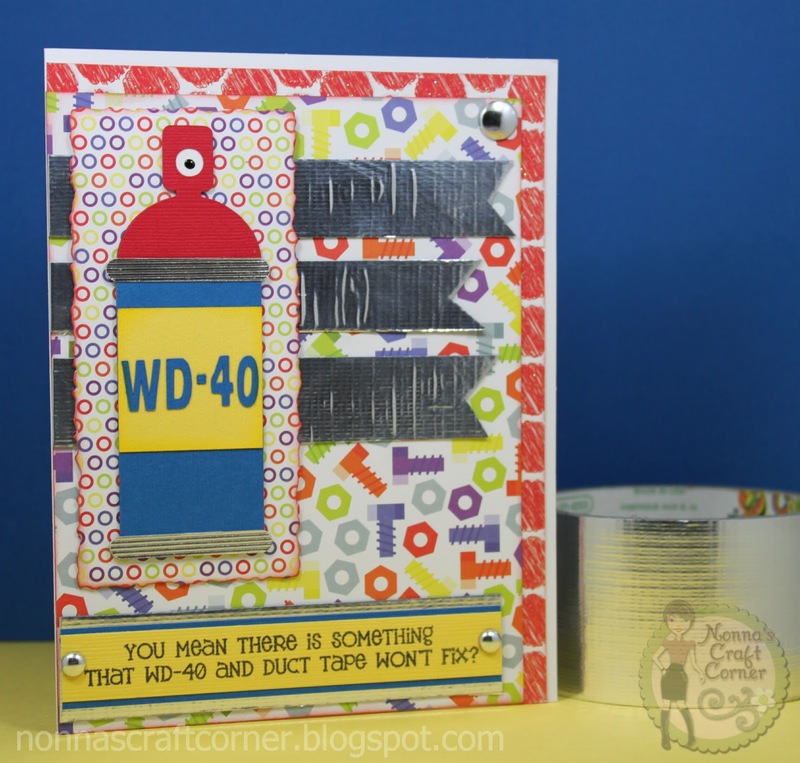 I googled WD-40 to find out what colors to use and went from there! And, here's a pic of my Daddy "back in the day". Good lookin' fella, huh? Tanya, I just know your dad would LOVE this !! He is heavens handyman :) I just adore this card the colors are just so fun and YES that sentiment is just perfect !! What would he do if he knew that they now make sprayable duct tape !? He would be fixing things like Crazy !! I hope you are having a great weekend ! Thank you for sharing this Awesome card with us !!! I agree with Brianna~your daddy would LOVE this!! 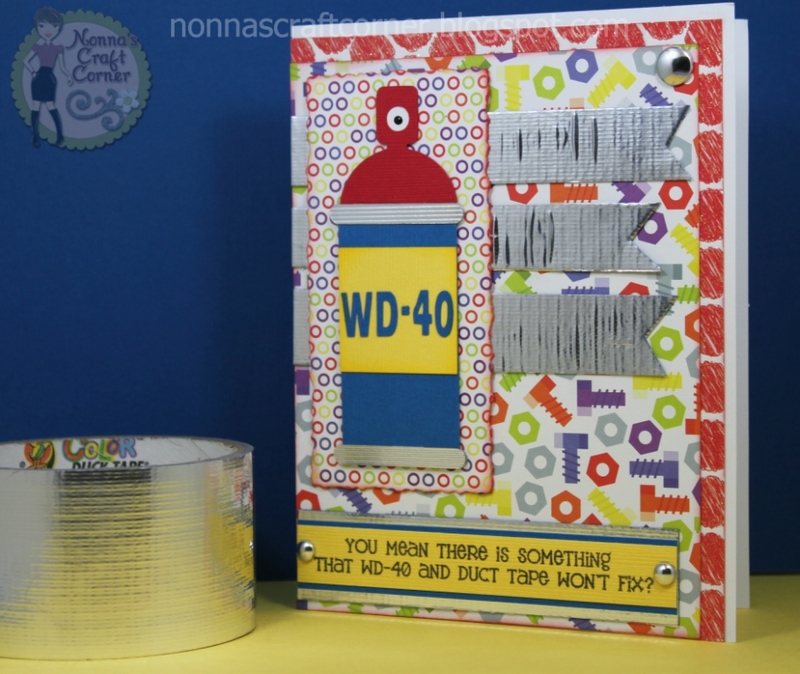 What a GREAT card, perfect cuts and LOVE all the duct tape!!!! Really great card!! Love that stamp! Yep, I agree with Brianna, he'd be on a roll with sprayable duct tape! 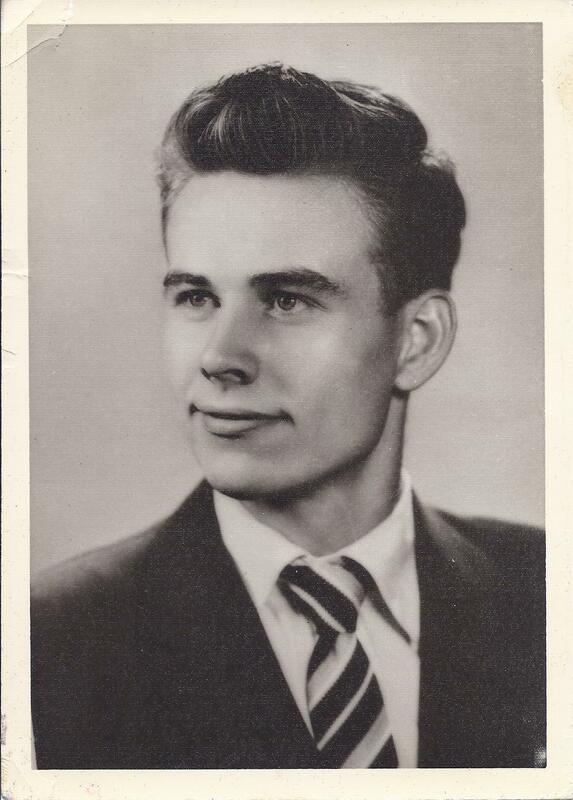 Wow Tanya, your father was a very handsome man. He may not be here to physically to receive the card , but I'm sure he is still enjoying it. Love the whole card way to cute and would be a great design for most men. I know everyone else has already said it but I agree your lovely dad will be grinning away at this one. Your dad is enjoying this card and smiling down at you.Its a Fun & Awesome card! !Could you see him now with all the colorful duct tape that there is and the amazing things that he would create with it..LOL!he would probably have his own Blog...LOL!My grandfather had a thing that any pain would go away with Panadol..LOL!Just to laugh a little the family would always ask him,"Grandpa,"what would be good for allergies? "....we knew it wasn't panadol but we wait on his response just to laugh and he woud say "Panadol"...LOL..Its was hysterical. Thank you for such a wonderful and joyful post. Awww....what a sweet post. Your card is a hoot...and your Dad's pix is super...so handsome. Hugs to you, my friend. You are so thoughtful. Your Dad did a good job. Tanya, your Dad is probably laughing and smiling at this adorable card! I think it's just terrific. Terrific card. My dad used WD-40 for everything. I lost him in '04. He would have loved this card, too. Aw Tanya.... Big Hugs. Love this card and I bet your dad would too!! So creative! Your card is totally perfect Tanya!! A wonderful honor to the memory of you Dad!!! He's smiling down at you, I'm sure. I love this idea. What a wonderful man and he raised a beautiful woman, inside and out! Hugs! This card is fantastic!! I'm sure your dad would have loved it! Thanks for sharing your story about him! Your card is fun and made me laugh! Tanya ~ I will address your card first! Hahahaha this is WONDERFUL, FUNNY and over the top CUTE!!! your dad saw this sweet Tanya ~ no doubt in my mind! He sounds like such an AMAZING man! I so can relate about our daddy's too! Mine will be gone 3 years this year! Miss him EVERY single day! First man I ever loved just like you!! Thanks for putting a smile on my face and sharing your daddy with us! He was a handsome man!!! How wonderful! Your Daddy has a big smile on his face by you honoring his memory in this world with such a wonderful card! It's always a good day when you can make someone you know is waiting in heaven smile. That's a really good day!